11th to the late Cynthia Hughes;,. been "called to higher service." "sincerity, compassion and dignity." She. made it clear to the Governor General. months of the dissolution of Parliament. been called to "higher service". for some considerable time to come". ernment employees could be solved. 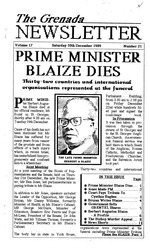 advice of Prime Minister Blaize. for the Vote of No Confidence". their children who are taking examinations. the Maurice Bishop Murder Appeal. meet the back pay bill. 51% to 49 % in favour of Goernraent. 70% to 30% in favour of Cable & Wireless. back pay with effect from December 1st. would be paid out from December 1st. school in athletics and football. the machinery of Government to a halt. back pay not later that December 18th. of GRENTEL shares to Cable & Wireless. the Unitary State came into being. hands of the "Mother Country'. Gairy again led the country. Opposition to Maurice Bishop of the NJM. he qualified as a solicitor. was the moving force vmbich forged. creating an opposition of 6.
issued by the Central Committee". of the bodies had their "bellies burst open". .. ihe Grenada Newsletter Saturday 30th December 1989.
done by a uniformed policeman. police by the accused . evidence to stand against all the accused. murder Maurice Bishop and others. Committee to perform the executions. character it did not possess." which started to shoot first. the Judge had put forward a "false defence"
of murder was the only real alternative". to make him an aider and abetter"
on the days before that date. from the dock by the accused. the jury that the defence of the "necessity"
performed acts subversive to the State. tinue until Friday 9th February. Centre at Grenada's National College. project valued at EC$22 million. isation of East Caribbean States (OECS). OECS Secretariat is included in the project. 1989 at a cost of EC$1.35 million. of China (Taiwan) to Grenada, presented. Paul Scoon on Tuesday 24th October. in loans for refurbishing existing homes. be completed by the end of December. prom-,ting training in needed skills. ducted to ascertain further training needs. reported to the World Health Organisation. Of the 17, 12 have died. have been male ard 7 female. figure of 158 in October 1988.
for the corresponding period in 1988.
paying tribute to Mr Blaize. l3aize who died on December 19th. rested in him under section 58 (I)of- :. 3d by the Governor General". Ben Jones of TNP to be Prime Minister. qy Acting Governor Dona Sila Calderon. was interred in the Brunsvick cemetery.